Dried apples is a perfect product when you consider the safety in them, after drying, the vitamins, minerals and nutrients. They are suitable for preparation of compotes and jellies, pie fillings, as well as useful components of cold soup, pancakes and various cereals. Finally, they can just have a soak in water beforehand. Fresh medium-sized Apple (about 120g) contains approximately 60 calories (i.e. 100 g falls from 45 to 50 kcal). It doesn't matter what kind and color of the fruit. Another thing with the dried apples: the fruit is dried, i.e., the weight became much less, but the calories remained the same as it was. It should also be noted that the caloric value of dried apples depends on how you store it. 100 g of those that are stored in dried form in a room with high humidity levels, fewer calories than 100g of apples, dried to hruskoci and stored in a dry place. Traditionally it is assumed that 100 g of dried apples contain 230-250 kcal or 5 times more than in 100 g of fresh. Naturally, soaked apples caloric level is reduced. These figures should be considered for those who meticulously calculates daily calories in your diet. At the same time, it should be borne in mind that, due to the high caloric content, apples can bring to the body a lot of energy. This property dried apples (as well as other dried fruits) are used by athletes and travelers during long walks. Use dried or slightly dried apples lies in the fact that, despite the duration of storage, they do not lose any of the vitamins (at least most of them), nor macro - and microelements, no acid they contain. To recognize dried apples the title of the storehouse of nutrients, it is necessary to know their chemical composition. Dried apples contains up to 12% of different sugars – fructose, glucose, sucrose, and 2.5% organic acids, among them malic, citric, tartaric, chlorogenic, erbenova. Dried apples are rich in the presence of pectin and tannins, organic compounds of iron and phosphorus, mineral salts. Almost all of the vitamins available in fresh fruits, preserved dried, just some number (e.g., vitamin C) decreases slightly. 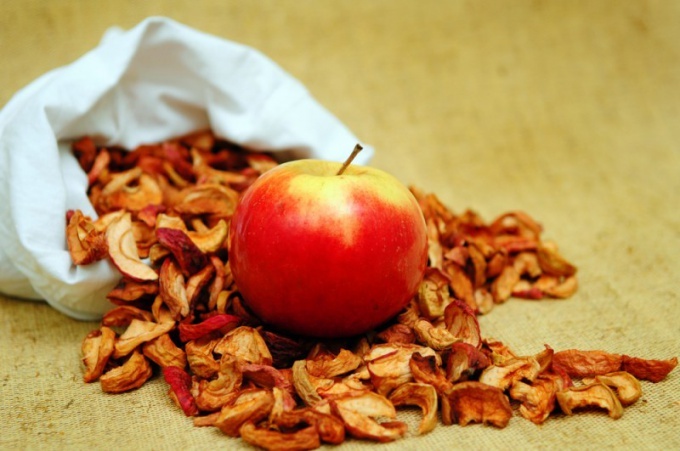 Dried apples – the real "Champions" in respect of the content of iron and magnesium, vital elements for the body. Iron improves blood quality and normalizes its components and prevents anemia, and the magnesium is the best mineral for the heart and nervous system. Magnesium deficiency is expressed in irritability, chronic fatigue, loss of vitality. Dried apples, it is advisable to include in the diet during the physical and emotional overload. In addition, this product does not cause bloating and flatulence (flatulence), so they can use people who are forced to limit consumption of dried fruit because of this feature of the intestine. Particularly valuable dried apples by the presence of the polysaccharide such as pectin, carrying enormous benefits to the body. Pectin helps to reduce blood sugar and cholesterol in blood, stimulates peristalsis, thereby causing it to operate normally and withdraw the feces and along with them, and metabolites (toxins). Timely cleansing of the bowel and rid it of deposits of hazardous compounds prevents, as you know, premature aging, appearance of diseases of internal organs, etc. The content of such important elements as iodine, dried apples is several times higher than oranges and bananas. The lack of iodine in the body, which, by the way, in Russia suffers about 70% of the population, affects many systems of the body, resulting in disturbed metabolism, growth and repair of damaged cells, etc. in addition, dried apples are a real repository of volatile production – substances that kill or inhibit the development of bacteria and fungi of various origins. Rind of dried apples are also rich in flavonoids, like the peel of fresh fruit. Flavonoids (group of the vegetative polyphenols) protect cells from the damage of membranes and destruction of intracellular structures. That is, they are able to neutralize free radicals generated by UV light. To talk about the benefits of dried apples can be infinite. They reduce the risk of cardiovascular disease, varicose resist, prevent degeneration and degeneration of the retina. Apple diet, including dried apples, globally recognized as one of the most effective diets for getting rid of excess weight. Finally, dried apples is just a delicious treat to replace candy and cakes. Given a sufficiently high calorific value of dried apples and a large content of sugars, their use should be restricted to people suffering from obesity and diabetes (note, not to exclude completely, but only to limit). Doctors do not recommend to eat dried apples ulcer in the period of exacerbation of the disease.